This playbook has been designed by county commissioners, for county commissioners, as you endeavor to fortify and protect your communities from high severity impacts of wildland fire. WHY? IT’S SIMPLE. EVERY WILDFIRE HAPPENS IN A COUNTY. When bad things happen, citizens call county leadership for guidance and answers, in addition to questioning when something happens that could have been prevented. Wildland fire is a natural and human-caused event in our forested and rangeland areas, but it is also becoming prevalent in more metropolitan and suburban areas where brush, grasses and open-space islands such as parks and interior green space are present. Fires in these seemingly safe areas are increasing across the US and contributing to the growing losses to life, communities, economies, infrastructure, natural resources, habitat and liability exposures to county agencies. EXISTING AND CONTINUED DEVELOPMENT INTO THE WILDLAND-URBAN INTERFACE (WUI) ALSO PRESENTS A GROWING CHALLENGE FOR COUNTIES REGARDING WILDLAND FIRE. It has become clear over the last decade that federal and state land management agencies will not be able to complete the amount of restoration and hazardous fuels treatments that are necessary to protect our communities from these catastrophic losses. 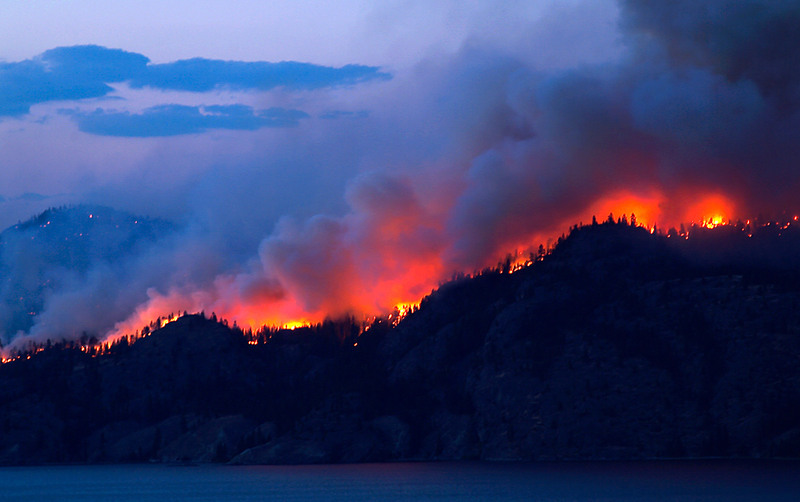 Drought and climate change are added factors that increase the risk of wildland fire. As a result, wildland fire will become one of the more effective tools that managers use when the conditions are right to create resilient landscapes that protect our communities and natural resources in the future. While state and federal partners work together to face the challenges within their span of influence, it is up to us, at the county level to provide leadership, guidance and sound decisions, rooted in science, to help our communities live safely with wildland fire. This Playbook provides a resource for suggested actions that county leadership can take to help their communities become more resilient and adapted to living with wildland fire. County agency and community members understand their risk of wildland fire and are taking steps to reduce risks and taking responsibility for living with wildland fire. County agency and community members know they have a wildland fire risk, but are unable to become prepared, due to capacity issues or an uncertainty about what to do. County agency and community members in an area where wildland fire is so infrequent (no significant fires for decades) that the risk is not realized and therefore address. Click here to find more resources and actions, as well as contacts available for additional support. Is aware of the risk of wildland fire and supports efforts to reduce risks and assists the community in its role in taking responsibility to reduce individual risk. Has a solid communications system in place including a web interface with wildland fire awareness, education and prevention information, and social media channels for communication with the public, e.g., PIO, Facebook, Twitter, etc. Has employees or a local organization(s) dedicated to wildland fire prevention, education and risk reduction practices, e.g., Wildland Fire Mitigation Specialist, Fire Safe Councils, Firewise Communities, etc. Likely has updated Community Wildfire Protection Plans (CWPPs) in place. These counties just need a few tools to assist their already strong communications efforts towards achieving resilient, fire adapted communities. Collaboration is the key to preparedness for the best possible outcomes during and after a wildland fire event. Conveying the county’s partnership and collaboration with other agencies and the community helps to build trust and ultimately creates an environment in which citizens trust that the county is prepared during current and future emergencies. Since this section pertains to fairly advanced counties with both understanding and capacity, these playbook actions revolve mainly around assistance with already strong communication efforts. County leaders, managers and department heads have multiple opportunities to address the public and these key messages can be interwoven to help communities understand their risk and their part in reducing risk/living with wildland fire. These can also help convey what the county has done to help its communities live safely with wildland fire. Get prepared for wildland fire season. [Insert name of county/community] is no stranger to wildland fire. Along with beautiful natural features, we also enjoy a varied landscape that provides a rich setting for business and recreation and increasingly, homes. It is this interface between development and the forested landscape that increases the risk of great losses due to wildland fire. Both natural and human-caused fires pose great risks to our county’s communities, infrastructure, economies, natural resources, and habitat. Be sure campfires are completely out. Call 911 to report fires or suspicious activity. With large wildland fire events occurring nearly each summer, evacuations from neighborhoods have become commonplace during these events. It is important to know what you will do in the event of an evacuation. Visit your local fire department for detailed information on how to prepare. Visit www.wildlandfirersg.org for preparation and evacuation tips. Wildfire season is right around the corner. We applaud and support the efforts of our residents taking responsibility to reduce risks around their homes and properties and prepare themselves for wildland fire. Know your home ignition zone and create defensible space around your home to reduce the impact of wildland fire to your home and property. If possible, harden your home with fire resistant building materials such as fire resistant roofing, siding and decking. With proper preparation, your home can survive a wildfire. Visit www.Firewise.org for tips and suggestions. We are proud to support annual cleanup events [events, free yard debris recycling, etc.] so residents can prepare their homes for wildfire. Visit your local fire department, state department of forestry [or Fire Safe Council, etc.] for information on these programs. Declared [name of County] as a wildfire hazard zone and eliminated wood roofing as an option on new homes and structures. Enacted codes and ordinances that outline fire resistant building standards for new construction in the fire-prone areas of our county. Convened the update of our Community Wildfire Protection Plan. Collaborated with new developers to balance values with risks within new community developments. Allow the free recycling of yard debris in the spring for annual defensible space preparation by residents. Prescribed fires (controlled burns) are an effective tool that land managers use when the conditions are right to help create resilient landscapes that protect our communities and natural resources. These prescribed fires clean up the forest floor and smaller vegetation that act as “ladder fuels” allowing fire to get into tree crowns. This keeps a future wildland fire on the ground where firefighters have the tools to keep it from becoming catastrophic. Your safety is our top priority. We are working closely with law enforcement to ensure safe and timely evacuations. Please maintain a high level of situational awareness and be ready to evacuate at a moment’s notice. Visit www.wildlandfirersg.org for preparation and evacuation tips. We are working closely with the [Name of Fire] Incident Management Team to convey local concerns and share information about our values at risk. We are embedded in the Joint Information Center to ensure that accurate and timely information about the [Name of Fire] is being distributed widely throughout our communities. Your health is one of our top priorities. If smoke from the [Name of Fire] is causing medical issues for you, seek respite from the local smoke shelter or pick up your smoke masks from the County Health Department. A quick recovery from these losses is our top priority. We are working closely with [Name-of-State] Emergency Management and law enforcement to respond to local flooding, debris flow and mudslide concerns. Please stay tuned to local radio, TV and social media for updates on uninhabitable and evacuation areas. Post fire flooding is a major concern. Please visit (State Emergency Management web link) for preparedness information. We are committed to the quick recovery of our community. We continue to support the local Red Cross efforts and those of the [name-of-organization] to ensure that everyone is safe and aware of the resources available. Feel free to copy and paste these suggestions. Be sure to grab the hashtag and the Facebook address for the local fire to include in your communications. Even small wildfires cause evacuations. Prepare your home and family for this intimidating event. Visit your local fire department or www.wildlandfirersg.org for how. Visit www.fireadaptednetwork.org and www.firewise.org for more on how to live with wildland fire. Don’t wait, EVACUATE! Prepare now for this scary situation. Ready, Set, GO! We are working closely with law enforcement to ensure safe and timely evacuations. Please maintain a high level of situational awareness and be ready to evacuate at a moment’s notice. Visit www.wildlandfirersg.org for preparation and evacuation tips. Your health is one of our top priorities. Smoke shelters are available for respite care at [name of locations] and smoke masks are available at [name of locations]. Even though [name of city] is experiencing some smoke from the [name of fire], they are open for business! Stop by! We work with the Incident Management Team each day to convey local concerns and values at risk. Get your smoke masks at the County Health Dept [give location]. Smoke shelters available at [name of locations]. [Name of city] is open for business. A little smoke won’t stop us! For up-to-date info on the [name of fire] follow #[name of fire] and [Facebook address]. Your quick recovery is our top priority. Visit [county web page link] for resources to help. County agency and community members know they have a wildland fire risk, but are unable to become prepared, due to capacity issues or uncertainty about what to do. Is aware of the risk of wildland fire or history of it, but does not have the administrative staff or funding to support specific county or community efforts to reduce risks. The community (and in some cases, the county leadership) is not widely aware of the risk and is not taking steps or claiming its role to reduce risk. Has limited communications capacity. May have someone on staff who handles some social media. May have static website. May or may not have any supported role for wildland fire awareness, education and prevention information. May or may not have local organization dedicated to wildland fire prevention, education and risk reduction, e.g. Fire Safe Council, Firewise Communities, etc. Likely does not have updated Community Wildfire Protection Plans (CWPPs) in place. These counties need just a bit more to assist them in broadening the understanding of the wildland fire risk and some tools to increase local capacity and buy-in toward the collaborative approach to achieving resilient communities. Counties and other agencies can do more together than they can alone. Collaboration is the key to preparedness and the best possible outcomes during and after a wildland fire event. Utilizing the resources that are available through partnerships and strong working relationships before, during and after a fire will help counties build trust and capacity to address the wildland fire issues they face. CONVENE OR UPDATE COMMUNITY WILDFIRE PROTECTION PLAN (CWPP). Regardless of whether you have a new CWPP or an update to an older version the key here is to convene the stakeholders. For a list of potential stakeholders and the steps to completing a CWPP, visit https://tinyurl.com/yc7ds8uy. The power of this group to learn from each other about their county’s wildland fire risk and its exponential communication capacity to carry those messages into the community is more than worth the effort. IDENTIFY THE WILDLAND FIRE RESPONSE CAPABILITIES. A quick phone call to the local fire department(s), the state fire protection agency and the federal land management offices (if applicable) can identify the capacity of each to respond and how they interact with each other during an incident. Be sure to get contact information for the Chief Officers as this is also the same list of players who may be involved in a Unified Command on an incident. Are agreements in place among emergency response agencies to allow responders to lend assistance across jurisdictional boundaries? Are your mutual and automatic aid agreements current if initial response exceeds local response capabilities? Convene a preseason meeting to discuss not only fire response and resource capabilities, but also how the County will be (and stay!) connected during incidents. This is a good time to discuss how Red Flag Watches and Warnings will be distributed effectively to ALL local media and stakeholders for further distribution. MAKE INFORMATION AVAILABLE TO RESIDENTS ABOUT ACTIONS THEY CAN TAKE TO BE BETTER PREPARED FOR WILDLAND FIRE SEASON. 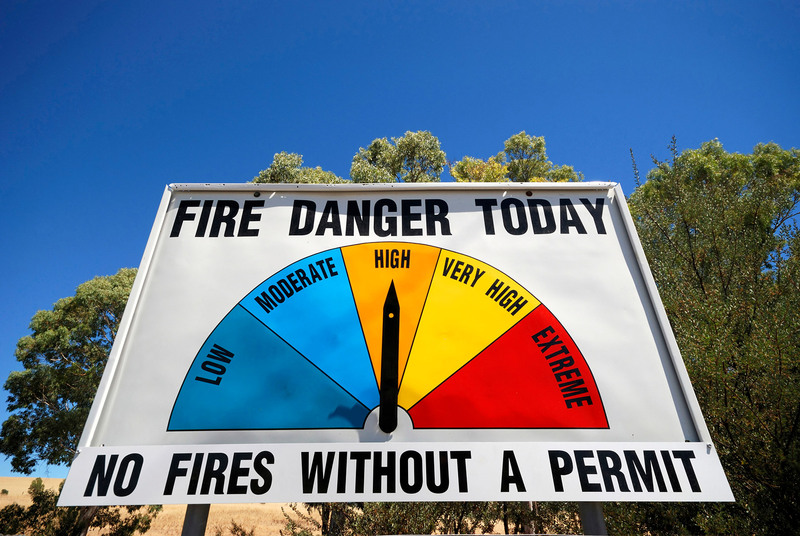 The need for defensible space and how residents can take easy steps to create it. www.firewise.org. The benefits of neighborhoods learning and taking steps to protect their neighborhoods together. www.firewise.org. Evacuation levels and preparedness information. www.wildlandfirersg.org. As fire season becomes imminent, be sure that Red Flag Watch and Warning announcements are transmitted to all local media and county staff for further distribution through communications outlets, including social media. Participate in daily updates and “cooperators meetings” with the Incident Management Team to hear directly about strategies and tactics being used on the fire. This is also a good place to share important information with the Team such as critical values at risk and citizens’ concerns. Participate in VIP tours with local and state dignitaries. Participate in the Joint Information Center and share the fire and evacuation information through County networks and social media. Solid and consistent communications are at the core of broadening the local understanding about wildland fire risk. Through various communications methods, county leaders, managers and department heads can use their multiple opportunities to address the public to weave in educational and action-oriented key messages to help communities understand their risk and their role in reducing risk/living with wildland fire. These can also help convey what the county has done to help its communities live safely with wildland fire. ​Get prepared for wildland fire season. [Name-of-Place] is no stranger to wildland fire. Along with beautiful natural features, we also enjoy a varied landscape that provides a rich setting for business and recreation and increasingly, homes. It is this interface between development and the forested landscape that increases the risk of great losses due to wildland fire. Embers from a nearby fire can be carried over a mile and land on roofs, decks and lawn furniture and ignite homes. Even small wildland fire events can result in necessary evacuations. It is important to know what you will do in the event of an evacuation. Visit your local fire department or state department of forestry for detailed information on how to prepare. Wildfire season is right around the corner. Residents can take easy steps to reduce risks around their homes and properties and prepare themselves for ember showers from nearby wildland fire. With proper preparation, your home can survive a wildfire. Know your home ignition zone and create defensible space around your home to reduce the impact of wildland fire to your home and property. Visit your local fire department or state department of forestry for information on chipping or recycling of yard debris events in your area. Controlled burns are an effective tool that land managers use when the conditions are right to help create resilient landscapes that protect our communities and natural resources. These prescribed fires clean up the forest floor and smaller vegetation that act as “ladder fuels” allowing fire to get into tree crowns. This keeps a future wildland fire on the ground where firefighters have the tools to keep it from becoming catastrophic. We are working with the Incident Management Team to convey our important values at risk and other concerns. Level One – Be Ready – be aware of the danger that exists in the area, monitor emergency services websites and local/social media outlets for information. Prepare for evacuation and evacuate persons with special needs, pets and livestock. Level Two – Be Set – Be prepared to leave at a moment’s notice. Gather your personal belongings. This may be the only notice you receive. There is significant danger to the area, and residents should either voluntarily relocate to a shelter or with family/friends outside of the affected area. Level Three – GO! - evacuate NOW. Leave immediately. Danger to your area is current or imminent, and you should evacuate immediately. If you choose to ignore this advisement, you must understand that emergency services may not be available to assist you further. DO NOT delay leaving to gather any belongings or make efforts to protect your home. This will be the last notice you receive. Key message: A quick recovery from these losses is our top priority. Each summer we experience evacuations from wildfire. Prepare your home and family for this intimidating event. Visit your local fire department or www.wildlandfirersg.org for how. We applaud our community for its preparation and learning to live with wildland fire. Visit www.fireadaptednetwork.org for more on how to live with wildland fire. We care about your fire resilience. [insert link to your website that lists codes and ordinances that apply to building materials and egress]. County agency and community members in an area where wildland fire is so infrequent (no significant fires for decades) that the risk is not realized and therefore little attention is given to the potential issues. Is not aware of the risk of wildland fire or history of it, and not addressing the potential issue. The community is also not aware of the risk and is not taking steps or claiming its role to reduce risk. County capacity to deal with the issue ranges from high to low in terms of staffing, funding, communications, etc. No local organization or agency dedicated to, or offering wildland fire prevention, education and risk reduction, e.g. Fire Safe Council, Firewise Communities, state or federal land management agencies. These counties need significant education of the level of risk they face and assistance in how to start working with their communities to learn to live with wildland fire. If you believe your county is unaware of the sleeping risk of wildland fire, you’ve taken the most important first step – acknowledgement of the issue. There are a number of ways your county leadership can help your communities become more aware of the issue and better prepared to receive wildland fire when it occurs. Collaboration is the most important method by which to achieve meaningful progress towards a more resilient county and a resilient, fire adapted community. Counties and other agencies can do more together than they can alone. Collaboration is the key to preparedness and the best possible outcomes during and after a wildland fire event. Utilizing the resources that are available through partnerships and strong working relationships before, during and after a fire will help counties build trust and capacity to address the wildland fire issues they face. With that concept in mind, the best place to start is by taking an inventory of potential resources and stakeholders in your area. CONVENE A COMMUNITY WILDFIRE PROTECTION PLAN (CWPP). A CWPP is a community-driven risk assessment and set of priorities and recommended actions for reducing risks to communities from wildland fire. The key here is to convene the stakeholders. For a list of potential stakeholders and the steps to completing a CWPP, visit https://tinyurl.com/yc7ds8uy. The power of this group to learn from each other about the county’s wildland fire risk and its exponential communication capacity to carry those messages into the community is more than worth the effort. Convene a preseason meeting to discuss not only fire response and resource capabilities, but how the County will be (and stay!) connected during incidents. This is a good time to discuss how Red Flag Watches and Warnings are distributed to agencies and to all local media and stakeholders for further distribution. What the home ignition zone is and how residents can create defensible space. www.firewise.org. The benefits of neighborhoods learning and taking steps to protect their neighborhoods together. www.fireadaptednetwork.org. Evacuation level information and preparedness information www.wildlandfirersg.org. As fire season becomes imminent, be sure that Red Flag Watch and Warning announcements are transmitted to all local media and county staff for further education about these important announcements and distributed through communications outlets, including social media. Participate in daily updates and "cooperators meetings" with the Incident Management Team to hear directly from incident managers about strategies and tactics being used on the fire. This is also a good place to share important information with the Team such as critical values at risk and citizens' concerns. Get prepared for wildland fire. [Name-of-county] has not experienced a significant wildland fire in [number of years]. That does not mean that the risk of such a fire does not exist. It is important as a County and a community of citizens to acknowledge this risk and take steps within our control to reduce these risks and prepare for wildland fire. Embers from a nearby fire can be carried over a mile and land on roofs, decks and lawn furniture and ignite homes. Residents can take easy steps to reduce risks around their homes and properties to prepare themselves for ember showers from nearby wildland fire. With proper preparation, your home can survive a wildfire. Visit your local fire department for information on chipping or recycling of yard debris events in your area. We are working closely with [Name of State] Emergency Management and law enforcement to respond to local flooding, debris flow and mudslide concerns. We are committed to the quick recovery of our community. We continue to support the local Red Cross efforts and those of the [name of organization] to ensure that everyone is safe and aware of the resources available. We meet with the Incident Management Team each day to convey local concerns and values at risk. Smoke shelters available at [name of locations. Request Fire Management Assistance Grant (FMAG) from FEMA. Update or create a Community Wildfire Protection Plan (CWPPs). Consider building codes, standards and/or ordinances that require fire-resistant building and development practices for new homes. Consider limiting development or enacting stricter building standards in high-risk WUI areas. Consider evacuation signs in high-risk neighborhoods with only one or two ways out.